The location of the workshop where this dish was produced has not been identified, though Tabriz or possibly Ottoman have been suggested. It is part of a group of dishes, with decoration derived from Chinese prototypes. The designs have affinities with the Tabriz group, but the petrofabric is similar to Iznik bodies. All are decorated with the same floral scroll on the underside. It is possibly the work of Tabriz-trained potters who had moved to Turkey, or Ottoman potters imitating a fahionable Persian style. Dish with a stonepaste body, painted in blue under a transparent alkaline glaze. Wide, very shallow foot-ring, and convex expanding sides. Flattened lip with lobed edge. Three spur marks set in a triangle 4 inches apart on the face. Three more similarly-spaced spur-marks are under the base, which is almost entirely covered by glaze. The central medallion, framed by a narrow running scroll border, depicts a hawk with raised wings swooping on the back of a partridge, facing right, and standing on a patch of ground, and from this grow flowering trees, curving round to right and left. In the sky, top left, are Chinese cloud scrolls superimposed on coils of foliage. Round the cavetto, large peony-flowers are joined by undulating stems with leaves and coiling tendrils. On the lip, a form of Chinese wave pattern. Encircling the exterior of the cavetto is a running scroll design of stems and leaves. The painting is in a strong cobalt blue which has had a tendency to run. 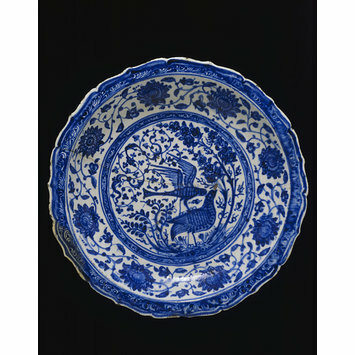 This is similar to the dish (562-1905), perhaps produced in the same workshop. Dish with a stonepaste body, painted in blue under a transparent alkaline glaze; Iran, possibly Tabriz, 1500-1550. Yolande Crowe, Persia and China: Safavid Blue and White Ceramics in the Victoria and Albert Museum, 1501-1738, Thames & Hudson, Geneva, Switzerland and London, 2002, cat. no. 3, p. 51. Lisa Golombek, Robert B. Mason, Gauvin A. Bailey, Tamerlane's tableware : a new approach to the chinoiserie ceramics of fifteenth- and sixteenth-century Iran, Mazda Publishers in association with Royal Ontario Museum, Costa Mesa, California, 1996, p. 152. Marina Whitman, Persian Blue-and-White Ceramics: Cycles of Chinoiserie, University Microfilms International, Ann Arbor Michigan, 1978, fig. 97a-b.